South Carolina police officer Michael Blackmore was able to talk a man out of a possible suicide attempt by bonding with him over football. Blackmore discovered the man was a Washington Redskins and South Carolina fan, and after a brief conversation, was able to coax him to come down from the railing. 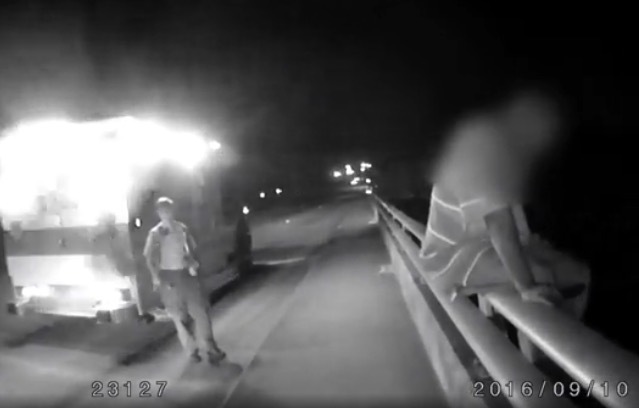 Finally, Blackmore was able to grab the man’s wrist with both hands, and his two fellow officers – Charles Browder and Jessica Nolan – helped lift the man back over the railing. Blackmore reassured the man he wasn’t in trouble and wasn’t going to jail. As the man stepped into the ambulance, responders allowed themselves a brief moment of thanksgiving – with one EMS worker high-fiving Blackmore before closing the ambulance doors. The man was taken to Palmetto Health Richland hospital, according to the incident report. This isn’t the first time Blackmore has had to talk someone out of taking his own life. Just a month ago, he was first on the scene where a man seemed prepared to jump from a parking garage on Main Street. Browder – who is in training with the police department – was with him for that as well. if your mind is so small that football can distract you from your perceived problems, maybe suicide is the best option anyway. A fan of the Redskins? THat isn’t going to help his mood.